Judi Parks’s show “Search & Destroy” consists of twenty four beautiful black and white images taken at the San Francisco club Mabuhay Gardens in the late 1970s. This was on display at Bunk House Gallery on the night of October 26th only. 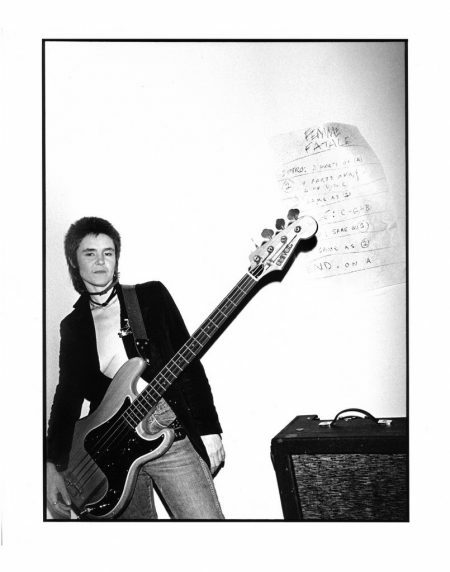 Parks was the bassist for the band The Blowdryers and documented what she has described as the short and intense period of time during which San Francisco had an authentic punk music scene. The images cover the famous and lesser known artists of the era as well as the bouncer and emcee for Mabuhay Gardens. Many of the artists in the punk music scene at the time, especially in San Francisco were visual artists as well, and their stage show and personae reflected the influence of the contemporary performance art aesthetic. 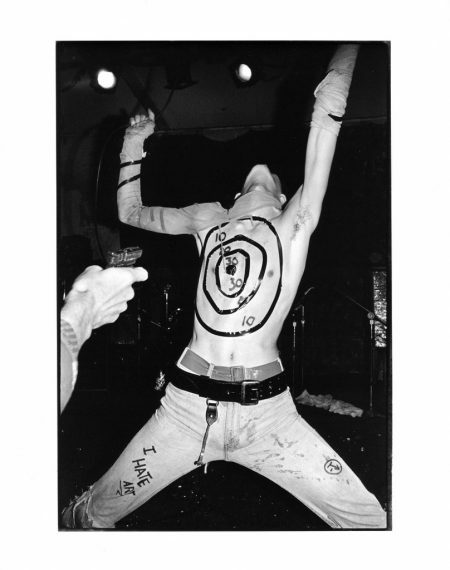 This collection of photographs has not been shown in the past twenty years and is a glimpse back into a corner of the punk movement that has influenced much of the DIY and “Maker” culture so prevalent in art and music today. Mabuhay Gardens also served as a Filipino restaurant and this further underscores the the DIY nature of the punk scene in San Francisco versus New York or London. The San Francisco scene was an intellectual and artistic scene which had little support from the massive music industry of the time. Not until the Dead Kennedys debut album in 1980 did the San Francisco Punk scene have a major label release. The photo “Judi Blowdryer” is one of the most telling in this collection. It shows Parks herself bearing a Univox Precision Bass copy as she leans against a wall with a poster of the chord progression to the Blowdryers song “Femme Fatale”. The ad hoc nature of the musical notation and the spiked hair and jacket with no shirt underneath epitomize the awareness of image which was at the heart of the San Francisco (and all punk) scene. “Target Practice” portrays Rozz Rezabek of fellow San Francisco band Negative Trend in a very nihilistic pose. He has concentric target rings taped to his bare chest while he is pelted with objects. His jeans have the phrase “I HATE ART” scrawled on them. Apparently this target practice performance was repeated more than once,and the anti-art graffiti speaks volumes. This intellectual self-awareness/self-parody was the earnest and yet ironic tone that defined the city’s punk movement in the late 1970’s. Parks’ documentation of this narrow window of time and place narrates the fleeting moments she witnessed. Ignored and intentionally hidden from mainstream musical attention, the early San Francisco punk groups allowed intensely creative people intense creative freedom. Stuck between the counter-culture movement in San Francisco and Marin County (which was itself an outgrowth of the Beat culture) and the late 1970s disco culture that emanated from the Bay Area, this was a candle which burned briefly. Parks notes that the music scene suffered in a sense because as many of the punk musicians doubled as visual artists, they left San Francisco for cities like New York which at the time offered incredible opportunity for young artists to be shown in galleries. 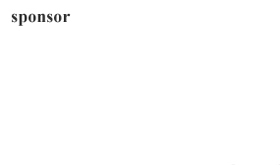 But this collection of work stands to remind us of the outsize influence those San Francisco pioneers still have.